Subiaco debuted two new league players in last Saturday’s Round One win over East Perth with Jack Beverley and Harry Marsh making their respective Subiaco league debuts. 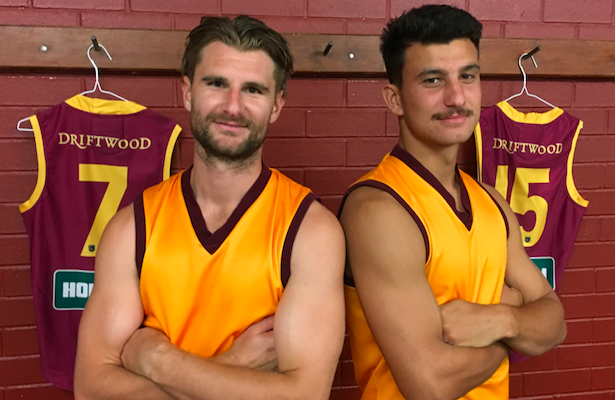 While they played at opposite ends of the ground on Saturday and their football journey to a WAFL debut were completely different, Beverley and Marsh will forever be linked as player 1640 and 1641 to represent the Subiaco Football Club. It was a successful first up appearance for both Beverley and Marsh, with the Subiaco league side recording a big win and both playing key contributions behind the win. For Beverley, a former Subiaco Colts captain and Reserves Premiership Player, the debut was a surreal one, after a series of injury setbacks over the past three years. Highly touted and respected as a member of the Subiaco Colts and Talent systems, Beverley who hails from Sorrento Duncraig was the Taylor Medal winner in 2015. However across 2016 and 2017, Beverley was forced to endure some difficult times due to injury. To get the opportunity to debut at league level was a surreal moment for Beverley. “It was really exciting when Beau gave me the word that I was in the team for Round One,” Beverley said. After a solid 2018 season at Reserves level, Beverley came back and put in his best senior pre-season in 2019, building a strong endurance base that has been the backbone of his elevation to the senior team. After spending most of his time with Subiaco in either the midfield or defence, Beverley flourished through pre-season as a pressure forward, where those defensive traits he had learnt were able to set a benchmark standard. That standard was seen across Subiaco’s pre-season review sessions, where Beverley came under close attention from his leaders for his ability to display the team’s values. “It means a lot when Kitch, Horse and the leaders are recognising the hard work that you are putting in,” Beverley said. As for game one, Beverley will always remember his first quarter of senior football, a quarter in which Subiaco piled on nine first quarter goals, having their best ever first quarter to start a new season. “I guess you feel lucky to come into a strong side and that first quarter we just had a lot of momentum,” Beverley said. Meanwhile for Marsh, the first game with Subiaco highlighted the importance that he will play in Subiaco’s premiership defence. Marsh came in as Subiaco’s marquee 2019 recruit, having had previous experience with Sydney at AFL level. Already in game number one for Subiaco, Marsh showed the poise and silky skills that saw him play 25 games for the Swans. Joining an already established defensive group, Marsh added a different element to the Subiaco back six, notably being able to set play up through the midfield and up forward. One of the most jubilant celebrations of the day was after Marsh kicked his first goal as a Subiaco player late in the first quarter. Marsh finished his first match with 17 disposals, eight marks and two tackles in a promising first up performance.